Corephotonics, a provider of computational camera solutions based in Israel has launched a new dual-camera module for smartphones called Hawkeye. Hawkeye combines a standard 13MP camera module with a second 13MP module that uses proprietary folded optics. When the shutter button is pressed Corephotonics’ image fusion algorithm merges the two still images from both camera modules into into a single image, offering a zoom performance that is equivalent to a 5x optical zoom. The company says the Hawkeye dual-camera zoom exceeds the digital zooming capabilities of a 130MP sensor and all existing dual-camera modules. 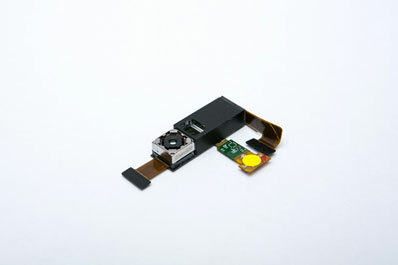 Its folded optics translates to a height reduction of the module down to 5.4mm, allowing for the design of very thin devices. Optical image stabilization is also offered in both stills and video mode. Along with Hawkeye, Corephotonics also introduced Slim Dual Camera which is focused on improving low light image quality, using a color image sensor in combination with a monochromatic sensor. The dual-13MP module puts out 21MP images and allows for slimmer designs than conventional setups. According to Corephotonics it delivers better resolution and lower noise levels than any current 21MP smartphone cameras. A previously announced 3x zoom module and Slim Dual Camera are expected to be ready for use in devices in mid-2016. For the Hawkeye we'll have to wait until next year. It appears that many industry players are viewing computational imaging as the solution to the zoom and low light limitations of current smartphone cameras. Hopefully we'll get the chance to find out if they are right sometime later this year. Time will tell how well this gimmick works. We last saw folded optics in the point-and-shoot market. The results were not very impressive and the concept doesn't scale up very well. All I really see is yet another ad hoc arrangement of tiny sensors, with a new image processing twist. Big deal. Well, it probably is a big deal, assuming that some manufacturer has placed a huge order. Looking forward to the first interchangeable lens phone. Then, the Metabones adapter to put my Sigma on it. it is already here, well it is an original case with lens mount , at least three lenses macro, telephoto, fisheye + 28mm. should come reviews the next weeks. But people will buy iphones with this gimmick instead. Since both camera most use the same real-size aperture to get the same depth of field, the telephoto will have 25X the ISO of the wide angle. Interpolation will help, but that has to hurt quality in anything less than bright sunlight. Also, when you zoom in less than 5X, the outside edge of the image is just an up-scaled version of the wide angle and isn't covered by the telephoto. At 4X, you'll have a border of 10% on all sides at 1/16 the resolution of the rest of the picture. "Hawkeye combines a standard 13MP camera module with a second 13MP module that uses proprietary folded optics. When the shutter button is pressed Corephotonics’ image fusion algorithm merges the two still images from both camera modules into into a single image, offering a zoom performance that is equivalent to a 5x optical zoom"
Isn't this the rumored camera setup for iPhone 7? Apple has been working on sensor based IS because OIS on folded optics doesn't work. This all seems very interesting but I still don't understand how dual sensors, folded optics and algorithms can achieve 5x optical zoom quality if there is no actual optical zooming going on. How is this achieved? The article wasn't clear to me on that...layman explanation of computational imaging please? You can simulate it yourself. You take a photo with your zoom at 24mm and then another one with zoom at 70mm. If you wanted a wide angle shot you just take the first one. If you wanted zoomed in you take the second. If you wanted something in between you do a digital zoom of the first and overlay the second on the part of the image it covers (scaled down to align). You get a sharp center and blurry edges. Folded optics are there just to avoid the lens sticking out of the camera. It's not related to computational part. Dual cameras enable shooting both photos at the same time. My understanding is the same as what otto k is describing. However, I hope the company has some magic to do better than that, or else only the center would be sharp while zooming. By the way, folded optic usually means they put the lens sideways and use a mirror at 45 degree angle to reflect light from the lens to the sensor. @otto k - A little clearer now, thanks. But if its blurry at the edges that's not true optical zoom quality. Do they use algorithms to then de-blur the edges...if not, how's this a good idea? It's easy to fall under marketing hype. Math to the rescue. 13MP @ 5X "zoom" ~ 13 x 5 x 5 = 13 x 25 = 325MP. Not 130. 130MP would be with ~3x "zoom". You should have inserted a sarcasm tag. I bet that a lot of people can't follow your math and will take that yippee for a yuppeeeeee!!! Phones are not especially good for anything much more than taking snaps. Most people (the general public) who own a camera-phone are clueless about using theirs properly. Those who shoot video, seem to think that everything is best filmed in portrait mode. I'm really not sure if adding an optical zoom is very important for the average user and in my case, I always carry a decent compact for a possible news event. That said, I really can't see the problem with building in a modest zoom that operates in a sideways configuration with a prism or mirror system. I suppose it depends on whether or not picture quality is of the slightest importance to you. Many think digital zooming is great! it's not an optical zoom, it's using two camera modules to create a high-quality digital zoom. There are many people, me included, who would rather not carry yet another camera with us, but use phones for not so serious shooting. And I really REALLY would like to have focal length suitable for portraiture in my phone. That said, sideways zoom optics/sensor w. prism would be just fine. the main problems with optical zoom on any smartphone is that at the long end the apertures get really slow...which in combination with the small image sensor is not good. Why do so many dpreview members act like they are the keepers of photography? What does, "keepers of photography" mean? The only one thing I liked about smart phone camera is the single focal lens it has. I wish it was standard 35mm instead 24-28mm these days. Now shick. The zoom came in.. I would like a sensor of at least 1/1,8", with pink/black silicon sensor, and some revolving sistem with 6 lenses, equivalent for 24, 30, 35, 40, 55, 90 mm lenses, all f 1.7 or faster. By far the largest problem with using a cell phone for photography is the fixed ~28mm equivalent focal length. It's the main reason I never use mine and carry a separate camera in the same pocket. There are other reasons too, but that's the biggest one. Absolutely have to have some telephoto capability. 28mm fixed is just this side of useless. Is Apple looking to leverage the same advantages that Corephotonics is claiming, for their iPhone 7 which is "expected" to have dual camera technology? The Slim Dual low light ability seems more interesting than crop/zoom on huge files. Of course both would be nice. If the rumors are true, I'd expect the iPhone7 Pro, or whatever it is going to be called, to come with a similar camera module. iPhone 7 pro, only $1600 usd. and a phone with a camera. What about cameras with built in phone functionality!?! Camera makers should be fighting back the onslaught from phones. well, have you checked the Panasonic CM1? "The company says the Hawkeye dual-camera zoom exceeds the digital zooming capabilities of a 130MP sensor..."
It means it can zoom and result in a better image than a (presumably) 13MP crop from a 130MP image. well, if you digitally zoom to the same degree on a 130MP sensor the resulting image quality will be much better than on a 13MP sensor, simply because there is more information/detail/pixels in the image you start with. Is digital zooming being done on-sensor these days? What about the pixel size of the hypothetical 130mpx sensor? Still, their 13 mpx sensor will exceed it in any way? It's exactly what Nokia used to do on the 808 and 1020, the 40MP sensors of those devices allowed for digital zoom that was pretty much as good as an optical one, at 5 or 8MP output size. I still have the 808. Cropping 5 megapixels from a 41-megapixel file is not equal digitally zooming or blowing up 13 megapixel shot to 130 megapixels. Whats the advantage of this over the Samsung K with 10 x optical Zoom? size and aperture. You can use fast apertures on setups like this while on the tiny optical zoom lenses a la Samsung K you lose a lot of light at the long end. Consumers want tiny cameras in their convergent devices with the versatility and performance of a real camera. It's amazing how far we've come with smartphone cameras since 2008. Traditional camera makers have something to really fear looking 10 to 15 years down the road. "Camera" makers have nothing to fear, they are different markets. Anybody who needed a large sensor DSLR to begin with wont be happy just using a phone. Anybody happy with only using a phone never needed a large sensor DSLR to begin with. P&S? Sure, they will die. But that doesnt encompass "camera makers". P&S is pretty much already dead, as manufacturers have admitted which is why we see the prevalence of 1" compacts now. This sounds very interesting. Kudos for innovating! no, the Zenfone Zoom is using an entirely optical zoom, the Corephotonics solution is computational.